Yesterday was an exciting day, and not just because of the solar eclipse! 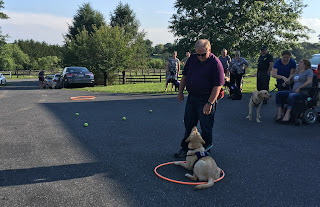 We welcomed 12 first year students from Dickinson College to Susquehanna Service Dogs as part of their pre-orientation! At Dickinson, incoming first year students have the opportunity to sign up for some element of campus life that interests them. They then get to come to campus early (pre-orientation) to learn about it. Or in the case of the 12 students who signed up for Dickinson Dog House, our Dogs on Campus program at Dickinson, they got to come to SSD! Over the past two days, these students have gotten a jump start on learning how to work with our dogs in training. 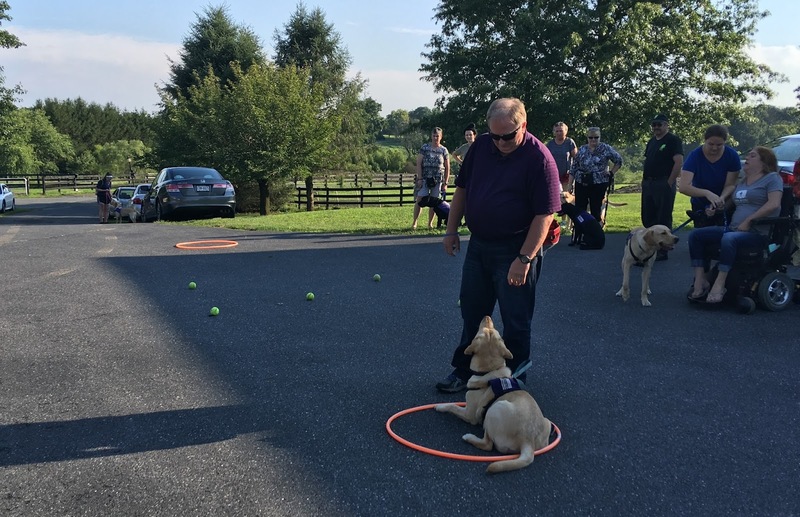 They toured our facility, learned clicker training, and worked with some of our dogs in advanced training. Once their semester begins, they’ll be able to start working with our dogs at the Dog House right away. This process also benefits our dogs in advanced training. Working with a novice handler is a great experience, especially since their future partners may also be novice handlers. The more experience our dogs can get working with handlers of varying experience, the better. Since it started, Dickinson Dog House has raised five dogs for us and they’ve whelped three litters of puppies. The Dog House is unique among our Dogs on Campus programs. Multiple dogs live in the house with the students, and the students take turns working with the dogs. Plus, there’s a host of other Dog House club members who are trained to work with our dogs and can assist throughout the day. These are a great group of students, and we’re looking forward to working with them over the course of their college career! If the dog runs right to their raiser, they score a hole in one! Raisers and dogs rack up additional for every time the raiser uses the word “come” beyond the initial cue. They also earn strokes if the dog stops to greet another dog along the way. Sounds easy enough, right? Well, just like the sand traps in golf, there are obstacles in this version of golf. In each puppy class, we introduce a new obstacle. The first time it was a water dish between the two hoops. Dogs had to run by the dish without stopping for a drink. At our last puppy class, it was tennis balls. Watch SSD Chickadee sprint right through them! In the video, Chickadee completely ignored the tennis balls. But what would you do if you know your dog gets really distracted by tennis balls (or whatever the obstacle is)? Set your dog up for success. Instead of trying for a hole in one, only walk a few feet away from your dog before calling them to you. Make the recall as easy as possible. It’s okay if it takes you two, three, even four or more short recalls to make it to the other hoop, as long as you’re making sure your dog can be successful with each recall. What if your dog stops to play with a tennis ball? Don’t worry! Just go get your dog and re-cue them into a “down” somewhere where you know your dog won’t get distracted by the tennis balls (or the other dogs in training near the course). Walk as far away as you think you can go and still have your dog be successful, then call your dog. A good recall can potentially save your dog’s life, so it’s important to practice often in many different environments with different distractions. Start small and build up so your dog can be successful. And don’t forget to give your dog a jackpot of treats when they do come to you so they learn that good things happen when they come running to you!